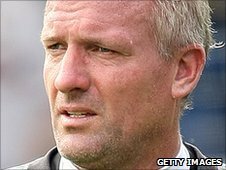 Stafford Rangers have appointed former England goalkeeper Tim Flowers as their new manager. It is the 43-year-old's first managerial job following a playing career featuring spells at Wolves, Southampton, Blackburn and Leicester. Since hanging up his boots he has been assistant manager to Iain Dowie at Coventry City, QPR and Hull City. Flowers will officially take charge at Marston Road following Saturday's Blue Square Bet North game at Nuneaton Town. Stafford have been without a manager since Chris Brindley resigned on 5 October, with Steve Wynn taking caretaker charge.